We put the power of calculating your janitorial bids in your hands. Our janitorial bidding feature built inside of Janitorial Manager allows you to accurately calculate your margins based on the expenses you make to clean the facility. This isn’t the only calculator built into this bidding feature. There is also a feature to calculate your expected expenses based on the expected margins you want to meet with the location or project. Are you struggling to build a bidding template that allows you to bid for a location efficiently and accurately? We have built our calculator to accurately pull information from the official ISSA 612 time and tasks standards. What does this mean for you? Each bid you create is built to the cleaning standards of ISSA (if you use the ISSA Templates). This makes every bid consistent based on the same set of standards and allows you to have multiple people in the field bidding new clients without fear. If you want to use your own standards for bidding in your company, no problem! We give you the ability to load your own settings into our calculator feature. If you want to double check our company standards with the ISSA 612 Time and Task Standards you can do that as well! We believe that businesses should have the ability to grow the way they want to grow! The ISSA Standards are a great measurement tool to compare your standards and make sure you are accurate in your estimations of the time it takes to clean a facility and the supplies needed. Meeting or exceeding budget expectations is always a plus in any type of business but especially the cleaning industry. 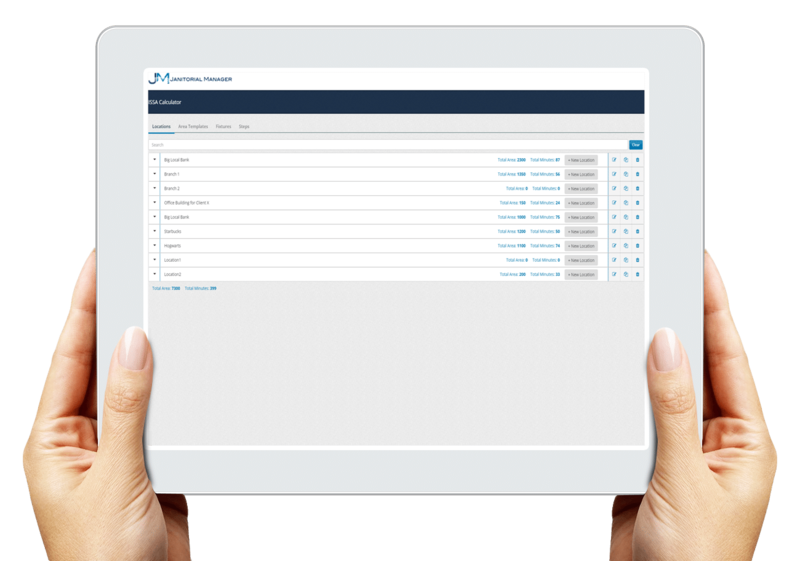 The janitorial bidding feature in JM allows you to accurately estimate the labor cost, supply cost, and all of the additional expenses in servicing a location so you aren’t surprised at how much revenue you generate per location. In addition to our Job Bidding Calculator that estimates the time it would take to complete a location, our Time Tracking feature in JM allow management to see if their employees are being efficient with their time and completing what is expected of them before leaving or moving on to the next place. Janitorial Manager can help you keep your funnel full because of the bidding feature. You have the ability to follow contact from becoming new leads, to having an employee bid their location, to turning those bids into a paying customer or following up with them in the future about the bid. In the past, the cleaning industry had janitorial bidding software options that were not user-friendly, and you didn’t have the ability to access the bidding software on the go. That’s a thing of the past! The Janitorial Manager job bidding feature gives you the ability to access your bids, start new bids, or even add a location to an existing account on the go!